Since early nineties, Russ Gabriel has been a driving force of the UK techno scene. He’s mostly known as the founder of Ferox Records, a label that is still around after more than two decades and just released Cottam’s new EP. Latest addition to Gabriel’s own immense catalogue was a recent split twelve with Steevio and it’s even difficult to count all his works under various guises. While Ferox mostly represented intelligent and in good sense funky techno, Gabriel’s own tracks spanned to harsher sounds too. A good example is “Neon EP” from 1993, which came out under the VCF moniker on Dave Clarke’s Magnetic North, a label that has seen contributions from Cristian Vogel, DJ Hell, Woody McBride and others. Those names reveal a lot about the repertoire and VCF’s five-tracker is no exception. It’s a caustic trip from the start to the end, pushing the pace up to 160 BPM. 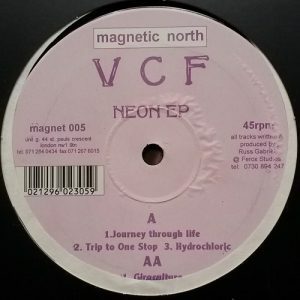 “Journey Through Life” opens with a nervous kind of acid trance and after experimental fast lane interlude “Trip To One Stop”, furious acid bursts shape from “Hydrochloric” a peak-time rave gun. The B-side contains rabid breakbeatish blast “Giroculture” and “Data 88”, which is a classic acid tune for foggy floors.